In Gujarat, 'NOTA' played spoil, know where to vote in the highest number of cities Results of Gujarat and Himachal Pradesh assembly elections are coming in 2017. Counting is going on in both states. In both states, the BJP seems to be getting a clear majority. In Gujarat, the BJP's victory has been decided and in Himachal Pradesh, it has been decided to start the lotus. So far, the numbers attached to the polling are clear that, in the results of Gujarat elections, Independent and NOTA (no candidate) has played the game. According to the Election Commission, the number of independent candidates in Gujarat has got 4.1 percent (988415) votes, whereas the NOTA has 1.8 percent (515708) votes. Which is more than the votes received by BSP and NCP. If the independents and noted voters had met the Congress, there would have been a major change in the outcome. Let us tell you that BJP got 49.2% votes and Congress got 41.5% votes.. 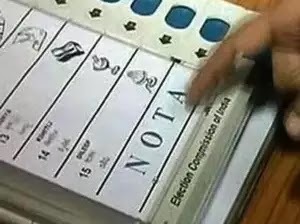 In Rajkot city-district, 8 assembly seats, the BJP has emerged as the 'NOTA' at the third place, except Congress, the official government resources of 2200 to 2500 votes out of Nottana and about 18 to 20 thousand votes were added, Rajkot city- A total of more than 20,000 people, including the Congress, BJP or any other people, did not want to be overwhelmed by the district.